We posted a while back about the bike rack design competition in New York City. As it happens, the winners were announced and the design duo from Copenhagen won the contest. Ian Mahaffy and Maarten De Greeve’s design reflects a modern simplicity that will greatly enhance the City’s streetscape. 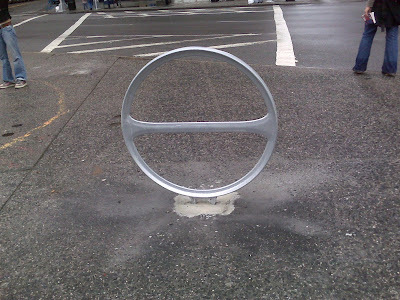 The rack is round with a horizontal crossbar, evoking an abstracted bicycle tire. Constructed of cast-metal, the design is elegant yet sturdy enough to withstand the harshest street environments. Congratulations. According to plan these racks will be the official bike racks of NYC and will be set up around the city. There were also indoor bike parking designs in competition. Have a look here to see the winners. Thanks to our reader Sean for the heads up.